I get nervous when it’s time for a new world, even though I’ve been assisting for more worlds than I can count. I try to be prepared, though it’s mostly about keeping things organized. My favorite part is assembling all the colors. 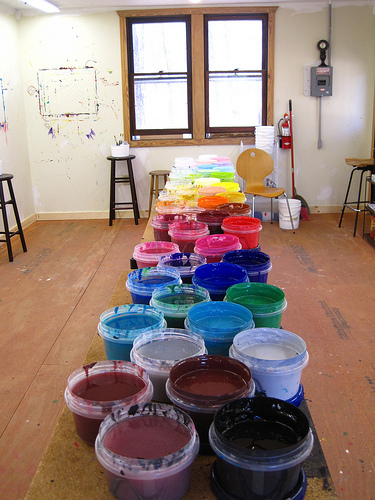 Every color I can possibly provide, arranged from deepest darks to lightest lights, as I haven’t yet managed a system to determine which ones will be needed in advance. I sweep the floor, twice if there’s enough time. Sometimes I try to scrub the remains of the last world from the walls, but the walls are hard to clean and they never seem to mind, they say it’s nice to have remnants of the worlds that have come before priming the canvas. I suppose they have a point, but I like to tidy things as much as I can before the messiness starts. New worlds are always messy at the beginning. But they usually figure themselves out. I’ve only needed to use the extinguisher once. 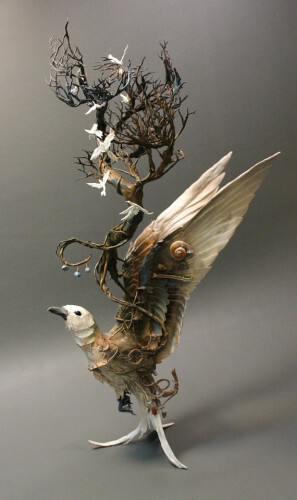 I found Ellen Jewett‘s sculptures via Tumblr this morning and fell promptly in art love harder than I have in quite awhile. More creatures can be found on her website, deviantART & custom work is available from her Etsy store. And of course I couldn’t resist ordering a custom piece. I am giddily excited to see what she comes up with, and I’ll post pictures when I receive it. I still don’t understand why an antique store needs to be open twenty-four hours a day, but the owner is nice and pays well and since hardly any customers come in during the night shift I have plenty of time to read. The main distraction is the typewriter. 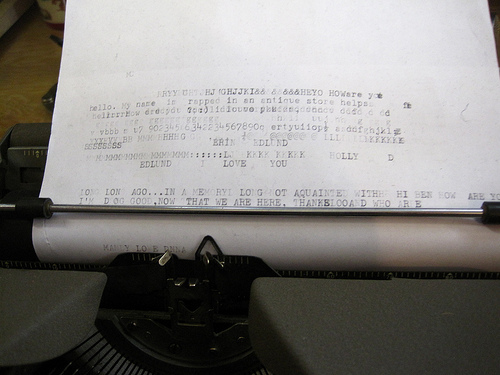 On my second night, one of several typewriters on a cluttered display started making this dinging sound and the keys kept flipping up and I couldn’t figure out what was wrong with it so I gave it a piece of paper. It typed a lot, though not particularly well. It said hello and made a joke about being trapped in an antique store, or at least I think it was a joke. I asked the owner about it in the morning when he came in for the day shift and he nodded and said that particular typewriter was haunted and suggested I not give it more than one piece of paper a night. I tried, but there seem to be a lot of voices in there and they have a lot to say so I buy extra reams of paper and let them type all night if they want to. They send love to different people. They make jokes and tell stories. I think they just want someone to talk to. I had this idea to pile up all my pseudo-research, flavor profile, inspiration-for-the-new-novel things for this post and then I realized it was too much and I didn’t have enough space to pile everything. So I settled for highlights, along with my most deco lamp. And of course the photo turned out all dark and mysterious. Not going to go through the whole list but the placing of Fitzgerald on top of Bioshock is oddly appropriate, and in a perfect world there would be more poetry, more graphic novels and a copy of Katherine Paterson’s Bridge to Terabithia, too, but I’m avoiding rereading that one on purpose. I’m still reading and note-taking and pulling bits of inspiration out of dark corners and trying to figure out how to structure everything properly. But it’s difficult to find the best structure while I’m still pulling together building blocks. It doesn’t even have a title yet. I renamed a character today, something I rarely do, but I think I needed to and hopefully it’ll help untangle her personality. It’s not a novel yet. It’s big and overwhelming and not story-shaped. It’s annoying. I’ve been working on this story for a comparatively long time but I’ve been so busy with other things in between that I feel like I’m behind, when really I’m only just getting properly started. And I’m realizing I have a bigger world on my hands (or in my head, rather) than I’d thought. Apparently I am not very good at keeping things simple. But I’d rather explore things properly and figure everything out and get it right even if it means reading more books and taking more notes and using more of that ever-problematic time. I feel like I have said all this before but I keep thinking about it every time anyone asks when the next book will be out. Not soon. Sorry. Please have a cookie or a drink (or both) while you’re waiting. I am going to keep digging through detective novels and mythology, taking notes and writing bits and pieces even when it feels like I’m wandering around my head in the dark with an unreliable flashlight. She says I shouldn’t pretend he’s a real dog because he’s not and I am “too old” for pretending. But the dog tells me that Momma is “speaking nonsense” and I should “pay her no heed” and he talks with an English accent which makes him sound very serious so I keep listening to him, which is not pretending but Momma doesn’t seem to know the difference. He likes to be placed on chairs near lamps because he says it makes him look more dignified, but Momma always moves him and then I have to move him back and re-arrange the lamps. He demands (“requests”) fresh flowers from the garden every day and I get them for him even though it makes Momma mad. I’d rather Momma be mad than the dog. He bites when he’s angry. Because Tumblr & Instagram have been getting all the photos lately. 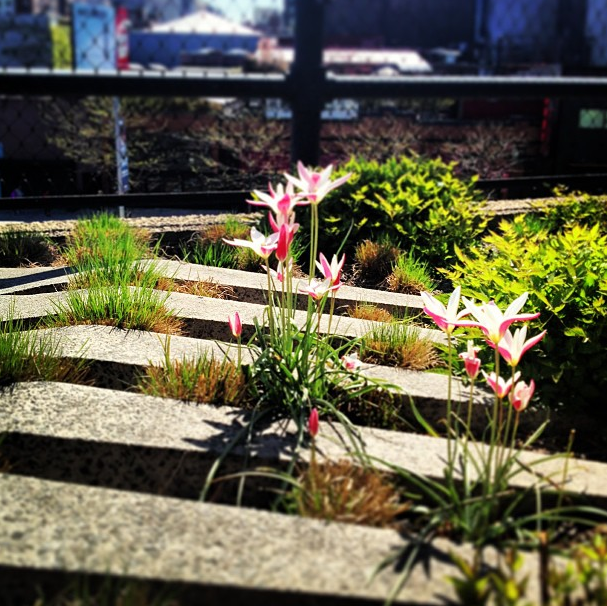 Flowers on the High Line. My latest piece of gorgeous bloodmilk jewelry. 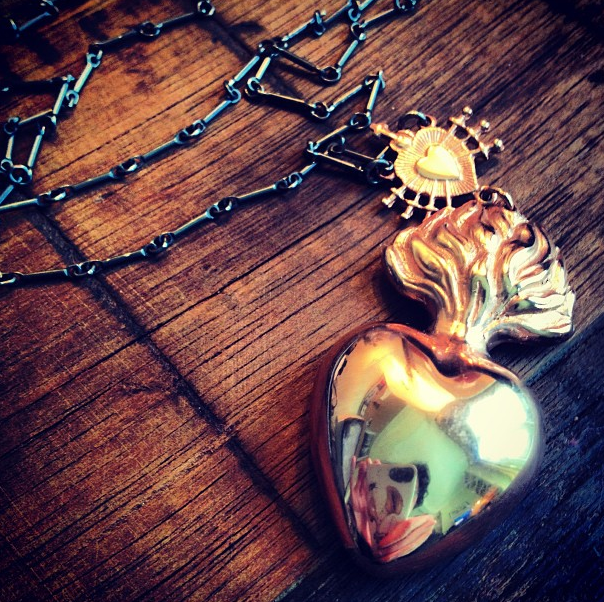 Rose gold, and it’s a locket, too. 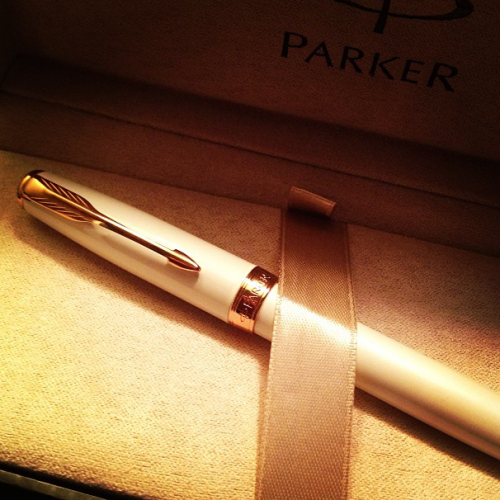 Newest fountain pen acquisition (this is how I know I’m in writing mode, new fountain pens and photo blog posts). Also I seem to be quite fond of rose gold lately. 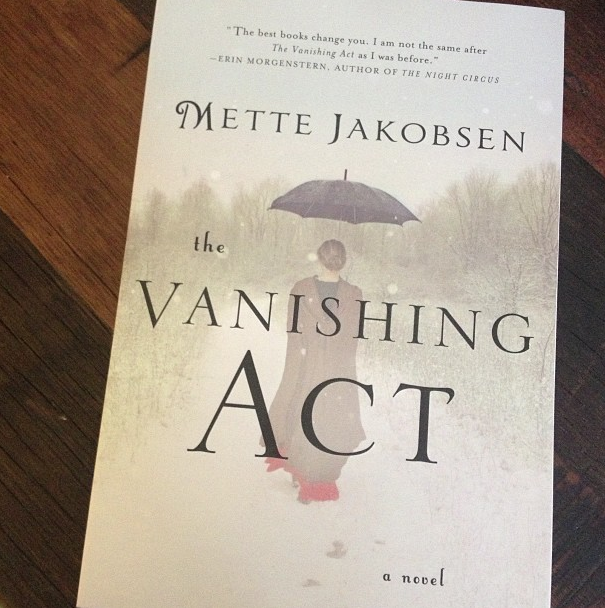 Spotted this gorgeous cover from across the bookshop and then realized it was my much-loved The Vanishing Act. I adore this cover. More evocative than the hardcover, I think. 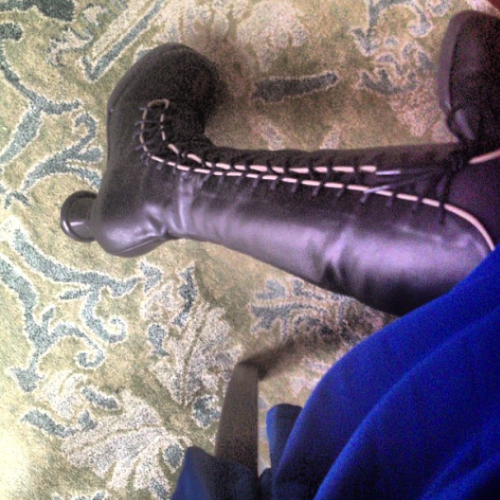 And last but not least, in celebration of International Fluevog Day, these are my Mini Sugar boots. 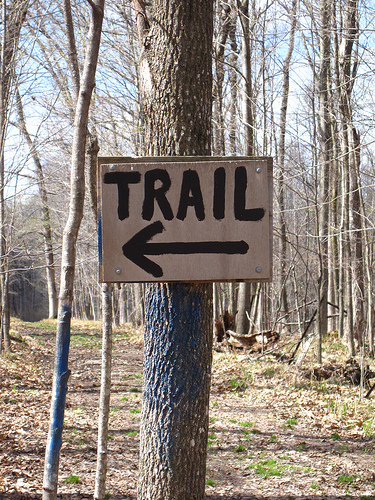 When I reach another fork in the path there is a boldly lettered sign on a tree that reads “TRAIL” accompanied by an equally bold directional arrow. In front of it stands a small girl with a teal backpack and ribboned pigtails, staring at the sign with a quiet, serious intensity. I am having an internal debate about whether to follow the sign or to see where this other path goes, she informs me before I can ask her if she’s lost. She points down a path on the right, equally trail-like and leaf-covered, one of several options that the left-pointing arrow has chosen to ignore. I ask if she’s worried about getting lost. She shakes her head, pigtails a-flutter, and explains to me that she has a phone and GPS and she can yell really loud if need be. The woods are not that big, she tells me, and she gives my hand a comforting little pat. But you can walk through them different ways so the walking seems longer and has more surprises, and you always get to where you’re supposed to be eventually, even if you get stuck for a while or the walking makes your feet hurt. She gives me a macaroon from her backpack and a cheerful wave before she heads off along the unarrowed trail. I stare at the sign after she goes for a long time, internally debating which path to take myself while I nibble my macaroon. And writing music is an interesting balance, at least for me, because it can’t be distracting but it can’t be so mellow that it makes me sleepy, either. 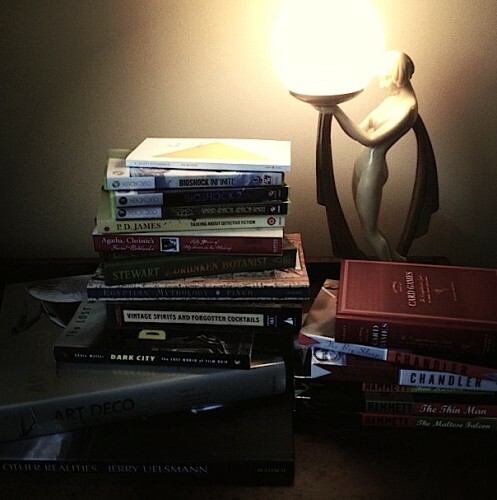 My writing rotation changes a lot, I’ve been making playlists that are mostly jazz (Coltrane, Ellington, some Charlie Parker) and some other bits and pieces that I keep adding to whenever something reminds me of how I think the new book should feel. I just got the soundtrack to The Great Gatsby and while I predictably adore the Florence + the Machine song the one that’s getting the constant repeat treatment is the Gotye track, “Hearts a Mess,” even though it bothers me that the title apparently does not have an apostrophe. I might put it on the writing playlist, haven’t decided yet. But my favorite recent musical discovery is something different. 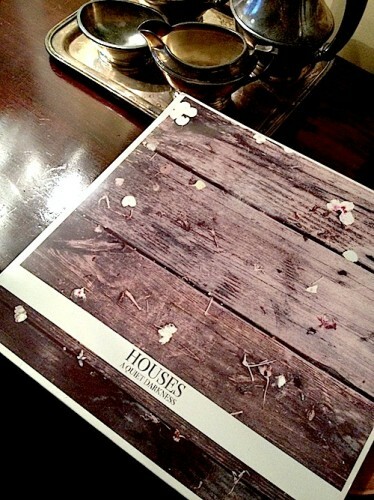 This is a band called Houses, their new album is called A Quiet Darkness. I literally clicked on this album in iTunes because I liked the cover. I’d never heard of them, had no idea what kind of music it would be, just found the cover art aesthetically pleasing. Most fortuitous iTunes click ever. Only had to preview a handful of tracks before buying the album, only listened to the album once before also buying their previous album. I can’t even describe them properly, the sound is so lovely and ethereal and layered and it is perfection as writing music. Highly recommended if you are looking for new music, and you never know what you might create while listening to it. People always ask me what the numbers mean. They assume I know just because I put them there. I don’t, not in any way that I can articulate. My mother used to say it was a gift but she doesn’t anymore. I think she also thought it would be a phase. I tried to stop a couple of times but the numbers itch in my brain, whispering where they want to go and what order to carve them in and I can’t think of anything else until I do. They mean different things, which makes it complicated. 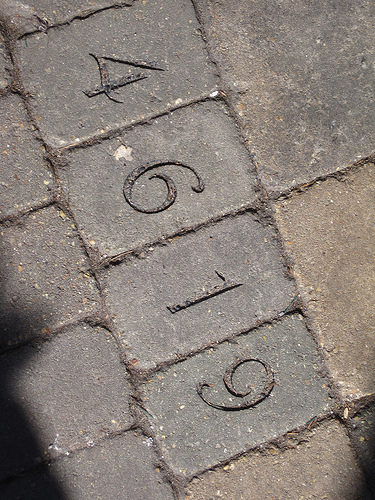 Sometimes they’re significant dates or countdowns, others are coded messages (always in different codes) and once they were winning lottery numbers but no one realized until it after the fact and I think that might have been a coincidence, I can’t be sure. I never know what to tell people when they ask, because the answer could be anything, it could even be nothing. It’s hard to translate numbers into words. I was thinking about doing a proper post about cocktails today but it was going to involve photos of my home bar that I didn’t have time to take to best show off the pretty bottles, and I still needed something to post about. I’m in writing mode, finally, so I have writing on the brain. Over cocktails yesterday I was discussing writing and since I am prone to making analogies I made one that involved a cocktail party and I was told it is a good one so I am going to share it with the internets. Let’s start with the party and then we’ll get around to how it ties into writing. You are throwing a cocktail party. You’ve invited a fair amount of people and you vacuumed and came up with a lighting concept and brought out the nice glassware and there are lots of nibbly things, possibly on sticks. One of your guests hasn’t met any of the other people there. Hasn’t even been to your home before. Is attending solo. You want to make sure that this guest has a good time and feels comfortable, but of course, you need to be in host mode, too. You take their coat when they arrive. You give them a drink. You introduce them to the other guests. You show them where the nibbly things on sticks are. You get them oriented and check in occasionally, but you don’t hover. If you notice they need a refill, you can subtly swoop in. You trust they can take care of themselves and have a good time while your attention is elsewhere. 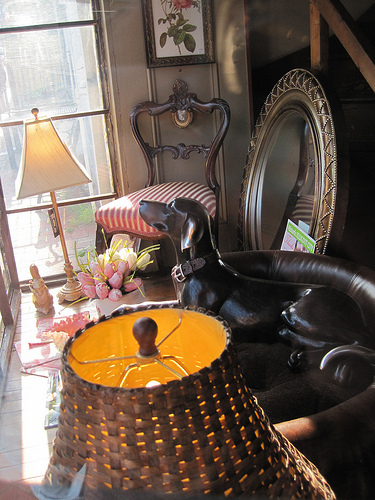 Your guest will pick things up from listening to the music and conversations and wandering through the rooms. The analogy part is kind of obvious, isn’t it? The guest is the reader. Your party (and your home) are the story. You make them comfortable but you don’t hold their hand. Trust them to go with things but maybe warn them about your dragoncat (or just assume that the smoldering paw prints on the carpet will speak for themselves). You don’t even have to tell them what’s in their drink, but they should probably know where the bar is. It’ll vary from party to party, but the basics of playing a good host are usually similar. You don’t need to explain every little thing but you need to give the reader something to hold onto, make them comfortable but not overly so. Keep them on their toes, but make sure they know what kind of surface it is they’re tiptoeing on. Especially if you’re going to pull it out from under them. So there’s your writing as cocktail party analogy. Use it or ignore it as you see fit. I tend to avoid writing advice beyond the “keep writing” & “rules are more like guidelines” stuff but I think orienting the reader is a sometimes tricksy thing and this seemed to me to be a good way to think about it, though I am overly fond of analogies. And cocktails.